In life, masks serve to transform identity, to obscure the wearer, to augment powers, or reveal subtleties of one's psychological state. Donned in rituals, performances and celebration, the mask is a ubiquitous feature of civilization, sometimes mundane, but often elevated to art. When life is over, the mask, tenacious and unwilling to lose its relevance, finds its place in death. The death mask, as it’s called, has its origins in ancient Egypt and Mycenae. Familiar examples are those of Tutankhamen and Agamemnon. These masks are not true death masks, however, as they are stylized portraits intended to capture the subject’s eminence rather than countenance. Crafted in precious metals and adorned with jewels, such masks were interred with the dead to accompany them on their journeys into the afterlife. In the Middle Ages a shift occurred, and the use of wax and plaster replaced portraiture to accurately reproduce the facial features of the deceased, who were no longer just powerful leaders but important figures from every discipline, such as Napoleon Bonaparte, Frédéric Chopin, the cranky French philosopher Blaise Pascal, and even the notorious Mexican revolutionary Pancho Villa. As commander of the División del Norte in the Constitutionalist Army, Pancho Villa contributed to the ouster of Mexican President Victoriano Huerta in 1914. Shortly after, he turned against the erstwhile Constitutionalist leader, Venustiano Carranza. Pancho Villa suffered two defeats to forces led by the Carrancista general Álvaro Obregón, so changed the focus of his revolutionary efforts on the United States-Mexican border, where he became a thorn in the side of the U.S. government, which he resented for having betrayed him by propping up Carranza. In 1920, following the ouster of Carranza, Villa agreed to end hostilities with the Mexican government, and was given a hacienda that he converted into a sort of Elysium for his former soldiers. Three years later, while running errands, Villa was ambushed by gunmen and assassinated. The posthumous fate of Villa, his vilification, and subsequent inclusion in the hagiography of Mexican Revolutionary heroes, is made even more fascinating by the curious destiny of his head. It was stolen from his grave in 1926, supposedly by an American treasure hunter, and was then sold to a billionaire who collected such relics. At some point a mask was made from the head, but its whereabouts were unknown for six decades, until a young art teacher at the Radford School in El Paso, Texas unearthed it from a storage facility located at the University. It was subsequently repatriated to Mexico, but not before being recast. 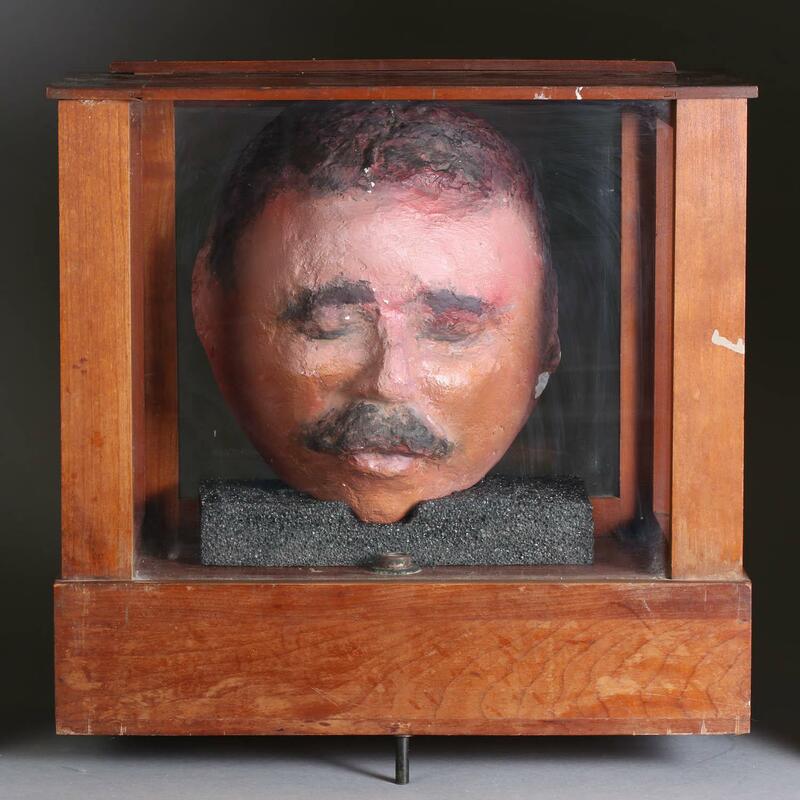 The Pancho Villa death mask in our current iGavel Interiors Sale of Fine Art and Antiques, is a plaster cast made from the Radford School discovery. Although Villa’s features have been painted on the surface by what appears to be an ingenuous pupil of the art instructor who found it, the underlying topography of the mask bears the impression of Villa’s mien, a snapshot of the radical figure whose reputation, although mired in controversy, remains indelible in historical memory.